You didn’t think about your outfit the night before, you’re scrambling to put something together so you don’t run late so you just grab something -- maybe it’s the first thing you see or something you always grab for, you pair it with another item and that doesn’t work for you, so you’re back in front of your closet starting to panic a little on what to put on. You grab another item just to realize you don’t like how it fits on you so that item goes back into the closet. The clock is ticking and you’re now at the point where fixing yourself a nice healthy breakfast is out the door -- so you just completely scratch the entire look and go with what you always wear. You’re already stressed and your day is just beginning. You don’t like the outfit you’re wearing but by now, you’re use to that. Does this sound like your life every time you have to get dressed? I know our busy lives can get in the way of taking care of things that’ll make it easier for us to look more fashionable and feel more confident about what we’re wearing and the start of this is knowing what you have in your closet. If your wardrobe is all over the place with clothes everywhere, that already is a headache on it’s own. Step one for you is organizing your closet. Step two is cleansing your wardrobe. What’s the point of taking up space on pieces you no longer need or fit you? Cleansing your wardrobe is apart of my recommended three steps to take before building a wardrobe as shared in my Building A Wardrobe: The Basics eBook. Step three is getting back to the basics. Why have a closet full of clothes if you can’t mix and match any of your pieces? You’re stuck with a one-time wear, single outfits or buying to never wear because you don’t have anything to coordinate with it. If getting dressed feels more like a chore and anxiety ensues each time you walk into your closet, then your life will change for the better by updating your wardrobe with the basic pieces. With your basics, you’ll be able to grab any item each morning (even if you didn’t pick out your outfit the night before) and easily pair it with other items in your wardrobe. Not only will you have more options but you can pair your basic pieces with everything you own! No more doubting if it’ll pair together or what to style with your outfits - pick out an item, pair with another item (or basic) and complete your look. With just a few wardrobe basics you can alleviate yourself from resorting to style that isn't you, save yourself the time from struggling to get dressed each day and stop struggling to be stylish. You probably own some of these pieces already but you're not sure on how you can use your basics to (1) stop struggling to create outfits around your clothes and (2) create different outfits around the same pieces. 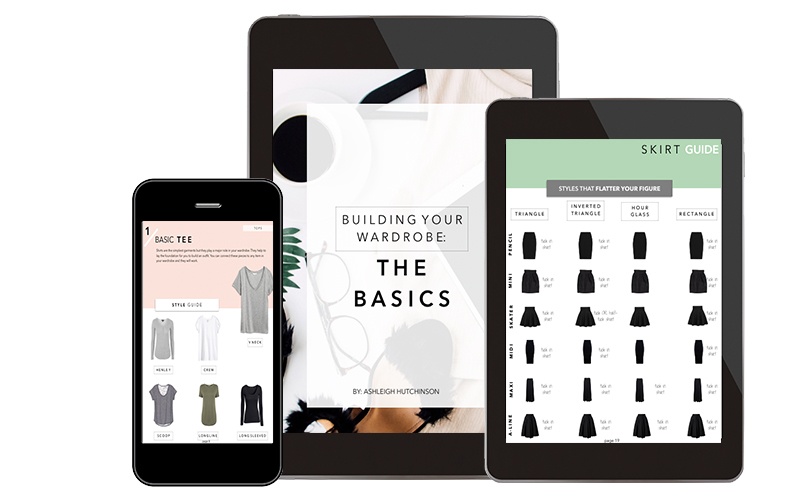 In my eBook, Building A Wardrobe: The Basics I lay out 24 different pieces that you can style with every item in your closet. You'll learn the pieces you need to add to your wardrobe that'll not only fill the gaps in pinpoint the different styles that work best for your lifestyle. The key is to build a functional wardrobe where you're not stuck with a bunch of one-time wears or pieces you never wear. Your basics will make it 10 times easier to pick out your outfits minus the meltdown and be able to start your day off on the right (fashionable) foot!